L-R: Navin Kamath/HBO, Akin Ceylan/Lionsgate, Craig Seidel/MovieLabs, Justyn Egert/Amazon. 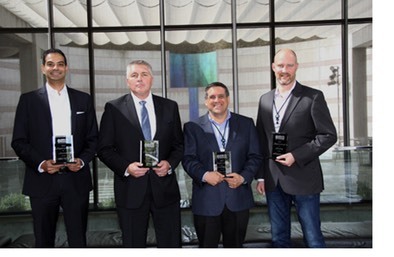 ENCINO, CA (October 15, 2015) … The Entertainment Merchants Association (EMA) yesterday presented The Divergent Series, Amazon, HBO NOW, and Craig Seidel of MovieLabs with “Digi” Awards for outstanding achievement in digital entertainment content, retailing, innovation, and leadership. The awards were presented at EMA’s Digital Media Pipeline, held at the Skirball Cultural Center in Los Angeles. The Divergent Series from Lionsgate received the Digital Content “Digi” Award, which recognizes the movie, television program, or other audiovisual work most unique in digital delivery over the past year, or that gave the consumer the best digital experience. The award was based on Lionsgate’s partnership with Samsung’s Gear VR for an immersive experience in keeping with the theme of the films. The award was accepted by Akin Ceylan, COO, Home Entertainment. Amazon was awarded the Digital Retailer “Digi” Award for the second year in a row.This award recognizes outstanding service by a company that sells or rents audiovisual works to the consumer through Internet-based digital delivery. Amazon was selected for its many digital offerings (both transactional and subscription-based), consumer devices, innovation, and overall experience for the consumer. The award was accepted by Justyn Egert, Head of Digital Video Store. HBO NOW was presented the Innovation “Digi” Award for taking the leap into the world of “over the top” (OTT) video and making it easier for consumers to access the digital content they want. The Innovation “Digi” Award recognizes the company that has shown innovation through its technology or programming to enhance the consumer experience of digital entertainment. The award was accepted by Navin Kamath, Vice President – Worldwide Digital Distribution & Partner Marketing. Craig Seidel of the Motion Picture Laboratories (MovieLabs) earned the Industry Leadership Digital Award, given to a company or individual that has made a significant contribution to the industry. Seidel was selected for his leadership in driving and supporting the development of industry standards and best practices that have created tremendous efficiencies in the digital supply chain and enabled content to get to consumers faster and cheaper. EMA’s Digital Media Pipeline, which is in its eighth year, brought together approximately 300 digital entertainment content owners, service providers, and retailers to focus on business-to-business opportunities in the digital delivery of home entertainment to consumers. The Entertainment Merchants Association (EMA) is the not-for-profit international trade association dedicated to advancing the interests of the $41 billion home entertainment industry. EMA-member companies operate approximately 52,000 retail outlets in the U.S. and 55,000 around the world that sell and/or rent DVDs, computer and console video games, and digitally distributed versions of these products. Membership comprises the full spectrum of retailers (from single-store specialists to multi-line mass merchants, and both brick and mortar and online stores), distributors, the home video divisions of major and independent motion picture studios, video game publishers, and other related businesses that constitute and support the home entertainment industry. EMA was established in April 2006 through the merger of the Video Software Dealers Association (VSDA) and the Interactive Entertainment Merchants Association (IEMA).